Who don’t want a good service with a low cost? No one. Everyone loves a good service at a lower price. Today, there are many cloud storage services that come with various offers. But, they generally offer a free plan with a spacious capacity, lead us to a confusion to choose the best one. Speaking of best free cloud storage service, surely there are some parameters a storage service decent to be called the best. Be it a spacious capacity of free plan, features to platform support. If you want to use your cloud storage service account as a centered file storage, then you need a service that supports multiple platforms. Dropbox is probably the best option in terms of this since it supports many platforms from Windows, Mac, Linux, Android, iPhone to Windows Phone. 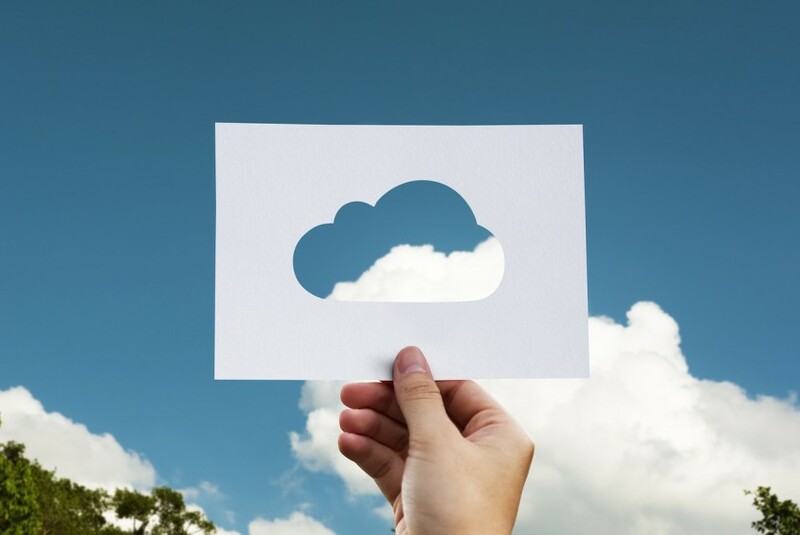 Conversely, if you just need a cloud service to have an online backup of your files, Degoo could be the best option since it offers a 100 GB of free storage (yes, free. 100 GB). This article will show show the best free cloud storage services existing on the internet. Sorted by the most spacious ones. Unless you are a Linux user, Degoo is the best option if you are looking for a cloud storage service that offers a spacious storage for its free plan. 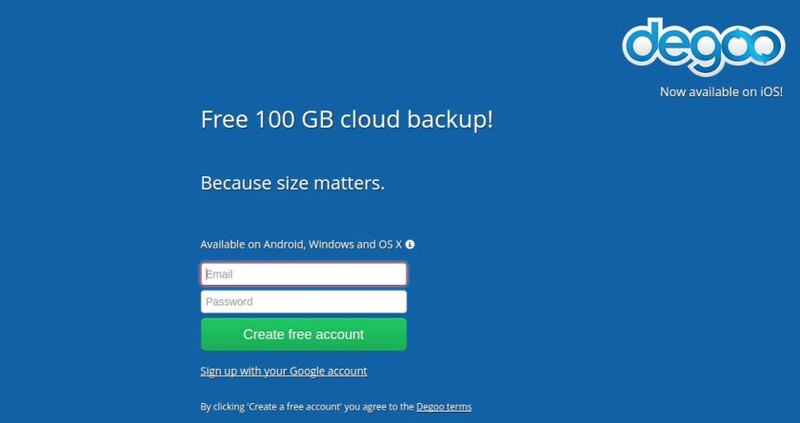 Degoo will be giving you a 100 GB of free storage which is great to backup files in a large number. Once again, you will get a 100 GB of storage, for free. Is this service secure to use? Yes. At least that’s how the service describes itself. Your files will be stored using a 256-bit AES (Advanced Encryption Standard). All server communication is encrypted using an SSL/TLS secure tunnel to transfer files between you and us. Unfortunately — as I mentioned earlier –, this service only available for proprietary platform users. No support for Linux. And even web. You need to install the Degoo client app in your Windows, Mac, iPhone or Android in order to be able using this service. MEGA is another spacious free cloud storage service. This service was founded by Kim Dotcom. In case you didn’t know, Kim Dotcom is also a founder of the similar service called Megaupload which was stopped by United States Department of Justice due to copyright infringement (please read here for more details). Before deciding to use this service just be sure you have a strong enough memory skill since MEGA is unable to recover your password once you forget it. Why? Because it offer zero-knowledge privacy with client-side encryption. MEGA not stores your password so it can’t recover it for your. Don’t too worry. You can download the Recovery Key to recover your account if something bad is happen in the future. One good thing you will love about MEGA is that it offers client app for nearly all platforms. Linux, Mac, Windows, iPhone, Android, Windows Phone and even BlackBerry are supported by MEGA. How fair and sportive. HubiC is also a great choice for anyone who is looking for a spacious free cloud storage service for storing files in the massive numbers. HubiC was developed by a French company OVH group. Other than its huge number of free storage, hubiC also comes with a support for nearly all major platforms like MEGA did. With the exception of BlackBerry. HubiC could be a great choice if you want to turn your account to become a centered file storage since you can sync it with all devices you have from Linux, Windows, Mac, Android or iPhone. So, you can access your files anywhere with any device. Of course, Google Drive should be on the list when we are in a talk about free cloud storage. Together with Dropbox and OneDrive, Google Drive is one of the most popular free cloud storage services. Your free 15 GB space will be divided into three Google’s services, Gmail, Google Photos and Google Drive itself. But still, that number is spacious enough for storing files in a huge number. With the exception of Linux, the client app of Google Drive is also available for all major platforms for easy access and sync. One of the prominent advantages of using Google Drive it that it has many supports and integrations from both, Google’s official services (such as Docs and Keep) and third parties. Google Drive is a great choice for a handling a collaboration project. 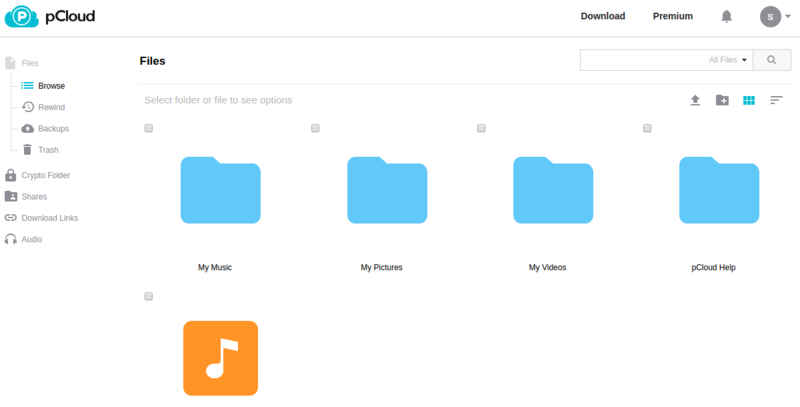 pCloud is probably the best free cloud storage it terms of interface. This service comes with a very sleek, clean interface with a turquoise folder icon like Mac’s. There is a handy button to switch the look from list to grid. You can also order you files by name or modification date. Managing files and folders are also quite easy in pCloud as well as sharing them. A good news for music lovers. pCloud has a built-in music player which automatically identifies any MP3 files you store in it. You can even create a playlist with the music player. The client app of pCloud is available for all major platforms including Linux, Windows, Mac, Android, Windows Phone to iPhone. So, it’s reasonable enough to say that pCloud is one of the best free cloud storage services in the market. It’s feature-rich, spacious, comes with a sleek interface and has a massive support for all major platforms. One of the advantages of Box is the capability to filter files by file type. Which is very useful if you already have too many files and meet a trouble to find your necessary ones. Box is also popular enough in the creative people scope. Some services have also given their supports to Box. Box is quite similar to Dropbox in many ways. The service also features a note app to enable users create some notes collaboratively, similar to Dropbox’s Paper. The only different is that Box doesn’t offer a client app for Linux. At least until today. Fortunately, Linux users who want to use this service can take advantage of its web app. MediaFire is known as a service to share a large file on the internet. You can gain bonus of space by referencing others to sign up to MediaFire. The downside of MediaFire is that you have to deal with ads. Every link you share on the internet (from free account) contains ads, which is annoying enough. MediaFire is the only free cloud storage service in this list to adopt this method. The service has no desktop client app. You can access your files on MediaFire via Android and iPhone app, other than web. OneDrive is not only one of the best free cloud storage services. It is also one of the most popular ones following the big name of Microsoft, the company behind the service. Since it is owned by Microsoft so there are my other services that can be integrated with the service including Microsoft Office Online and OneNote. OneDrive comes with an easy-to-use interface, typical of Microsoft. You can sort your files by name or modification date. OneDrive also makes it easy to share your files and folder with anyone you want. You can even embed your folder/file on your site. Though it’s owned by Microsoft, other platforms users can also use the service. Including Android, iPhone and Mac users. Linux users can take advantage of the web version of OneDrive. Not as popular as OneDrive and Google Drive but, Open Drive is not a bad choice if you are looking for a cloud storage with a built-in online office suite. The online office suite of Open Drive — which consists of document, spreadsheet and presentation maker — is powered by Zoho. You can also crate a plain text directly from this service. In addition, Open Drive also features a task manager. You can take advantage of this tool as a collaboration tool since you can also create a group for a specific project. The client app of Open Drive is available for Windows, Mac, Android and iPhone. There is also a WordPress. Interestingly, Open Drive also features an analytic tool to monitor the bandwidth usage of both download and upload. Finally, here it is. Dropbox is probably not the best choice if storage capacity is something you are looking for since it only offers a 2 GB of free storage. However, Dropbox is a nice choice if you are looking to use your free storage service account to work collaboratively since it has a number of built-in features to support that need. Including Dropbox Paper, an online note-taking app that was released in April 2015. Apart from it, Dropbox also has so many supports from other services. The client app of Dropbox is available for all major platforms including Linux, Mac, Windows, Android and iPhone so you can access your files from anywhere using your devices. The only requirement is internet connection. Many people love using Dropbox because it is very simple and uncomplicated.